A detached stone farmhouse and barn situated in a wonderful rural position, The property has been developed giving the first floor accommodation over to the primary living area, affording panoramic long distance views to all elevations. The principal living room has stunning views, taking in Longridge, Beacon and Parlick Fells to the North and Waddington Fell and Pendle Hill to the east with Yorkshire Dales beyond. The living kitchen has an open balcony with views to Bleasdale and the Fylde coast. The property has mature well tended garden areas, extensive equestrian facilities including stabling, outdoor school and paddocks with additional land available by separate negotiation. The property is ideally located in between Clitheroe and Preston, with good access to the motorway network making it commutable to the major business centres of the North West. Converted stone farmhouse and barn with pitch slate roof supported on timber. Sealed unit uPVC double glazed windows and doors. Stone slate floor. Leaded glazed timber door from entrance porch. Double panel central heating radiator, traditional central staircase leading to first floor accommodation. Sealed unit hardwood double glazed window to front elevation. Built in wardrobes with traditional timber panel doors, double panel central heating radiator. Containing three piece suite comprising fully tiled shower cubicle with ‘New Wave 2000’ shower fitment. Wash hand basin in timber vanity unit, low level WC and timbered vanity unit. Full ceramic tiled walls, sealed unit uPVC double glazed window, extractor fan, electric wall heater, chromed radiator towel rail. Sealed unit hardwood double glazed window, fitted shelving and cupboards, double panel central heating radiator. Containing three piece comprising fully ceramic tiled bath with chromed mixer tap, pedestal wash hand basin, low level WC. Travertine marbled floor, full ceramic tiled walls. Sealed unit hardwood double glazed window. Full wall panelled high stand radiator. Boiler cupboard ‘Valiant’ gas boiler providing central heating and domestic hot water. Fitted wardrobes, sealed unit hardwood double glazed window, double panel central heating radiator. Containing hand grip panel bath with ‘Myer’ power shower fitment over, wash hand basin in vanity unit, low level WC, half ceramic tiled walls, electric wall heater. Sealed unit hardwood double glazed window. Sealed unit hardwood double glazed window, double panel central heating radiator. Containing handle grip panel bath with tile splash backs, pedestal wash hand basin with tile splash backs, low level WC with tile splash backs. Hardwood double glazed window, electric wall heater. Sealed unit hardwood double glazed window, wash hand basin in oak vanity unit, low level WC and radiator. Fitted cloaks hanging. Range of base and wall units. Single drainer stainless steel sink with hot and cold supply, plumbed for automatic washing machine and drier, herringbone set ceramic tile floor, double panel central heating radiator, uPVC double glazed stable door. Traditional staircase with timber spindles and hand rail. Office landing, sealed unit hardwood double glazed windows to both front and rear elevations, traditional central timber balustrade and hand rail. Superb open first floor lounge offering spectacular views to three sides. Traditional dressed stone fireplace with raised hearth housing ‘Clear View’ multi fuel stove. Sealed unit hardwood double glazed windows to front, two to gable and one to rear elevation making this a light airy room. Two double panel central heating radiators, double doors leading back to landing area. Sealed unit hardwood double glazed windows to both gable and rear elevations, fitted book shelf and cupboards. Double panel central heating radiator, double doors leading back to landing area. Superb open kitchen with spectacular views to gardens and countryside beyond. Range of high quality bespoke hand-made oak furniture with complimentary matching pink granite work surfaces and ceramic tile splash backs. ‘Villeroy & Boch’ Belfast style double sink with chromed mixer tap, built in larder and storage cabinets. Blue enamel electric ‘Aga’ with diamond set tiles splash backs, ‘Aims’ electric system allowing the ‘Aga’ to be programmed to turn on when required. Sealed unit double glazed ‘French’ doors leading to suspended balcony with wrought iron and timber balustrade. Ceramic tile floors, low voltage spotlighting to ceiling. ‘Bosh’ two ring ceramic hob and ‘Smeg’ combi microwave oven, built in ‘Neff’ fridge and freezer and built in ‘Bosh’ dishwasher. Courtesy skirting electric heater. The property is approached from the main highway through a stoned and timber five bar gate to a large tarmacadam parking area for several vehicles. A large garage block constructed of block work with timber truss roof. Excellent storage garage with parking for four vehicles. Electrically operated up and over door, light, power and water installed. Twin uPVC double glazed window to rear elevation, uPVC side entrance door. Outside toilet with low level WC and sink. Sealed unit uPVC double glazed side window. Timber and coal storage compartments. Adjoining the garage is a stable block. Timber fencing to front allowing parking of horse box. Timber sliding entrance door, two stables, tack room and feed storage area. Light and power installed. Storage for horse box to side of stables, coppice of trees to rear. To the eastern boundary of the property is a ménage which is a levelled sand school with carpet chip finish. Paddock to the north elevation and a secondary paddock to the south elevation of 2.510 acres. The principal to the property lie to the south west elevation with mature shrubs and terraced lawns with central stone patio BBQ area with raised decking, separate southern side garden again mainly laid to lawns with ornamental lilly pond with adjoining shrubs and rockery. Discreetly hidden propane gas supply. 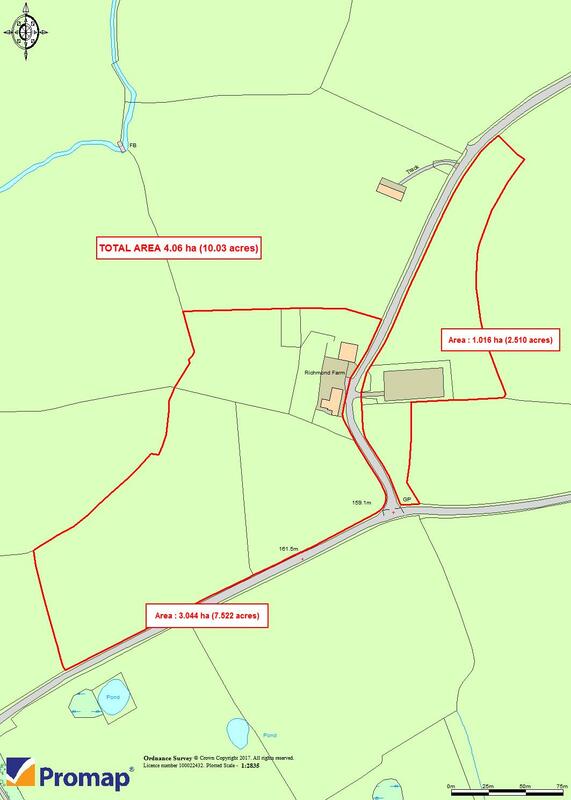 To the south west boundary there are adjoining paddocks extending to approximately 7.522 acres. Mains electricity, mains water (metered), propane gas supply, sewerage to soak away septic tank. B4RN fibre optic broadband network installed providing 1,000Mbps FTTH broadband. Band G payable to Ribble Valley Borough Council.